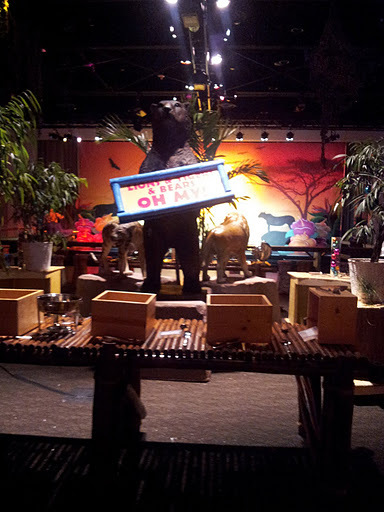 Blog A WILD Safari Holiday Party for Outback Steakhouse International! A WILD Safari Holiday Party for Outback Steakhouse International! 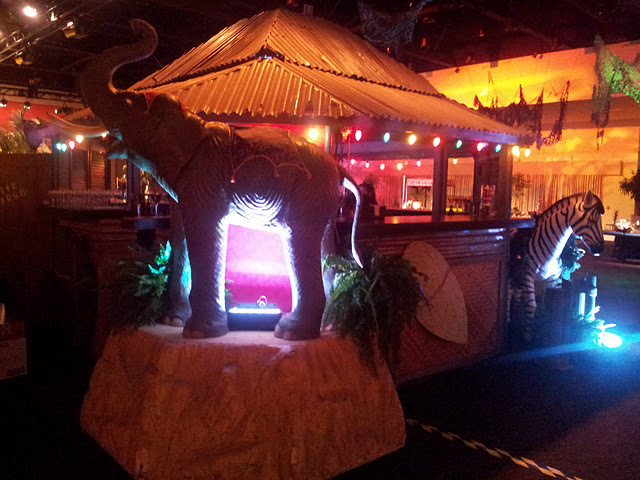 Max King Events unveiled our newest theme concept, A Wild Safari, at an event with some very fun guests, the Outback Steakhouse International holiday party in Tampa! Every year this enthusiastic group requests unique party themes to celebrate the holidays and their team members, and this year was no exception. The Wild Safari concept included hot colors, like fuchsia and turquoise, dozens of animal statues, and one of a kind buffets! 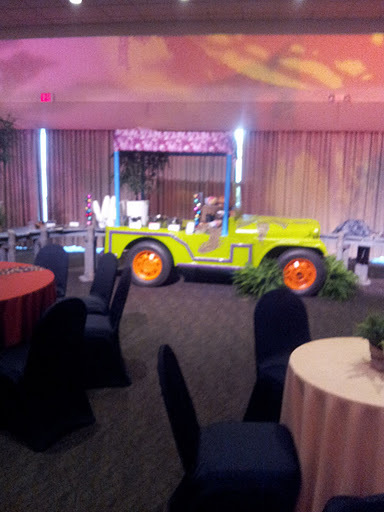 Our original Jeep was transformed into a lime green and purple palm frond-painted buffet! A pink camo roof cover and blue bamboo supports added to the colorful and functional display. Serpentine dock tables extended from the front and back of the Jeep to provide ample buffet space. “Lions, Tigers, and Bears-Oh MY” was the catchy title to this buffet. Our existing life-size tiger statue was paired with two of our newest animal statues, a 7′ high grizzly bear and 5.5′ long lion, to create a truly unique buffet centerpiece! Bamboo buffets and stations provided the table space for the evening’s food display. The four-sided “Explorers Bar” became the prime beverage area for the event. Each corner of the structure featured a life-size animal statue, complete with faux stone pedestals, foliage, and up lights. Christmas lights were hung on all sides of the structure, bringing in a little more holiday cheer to the bar display! Perimeter “Guide Services” bars around the space provided additional beverage locations, as well as complimented the overall event look. 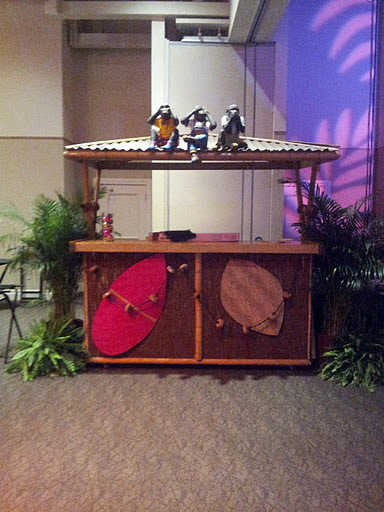 Natural tiki bars became wildly colorful with the addition of hot color animal print shields, and even a trio of monkeys watching over head! The Bush Truck station (also known as Rusty Redneck in the Plumtackee theme world!) had a “wild” make over! The truck was painted in bright yellow and turquoise zebra stripes, complete with a blue camo roof cover directly over the grab-n-go area in the truck bed! 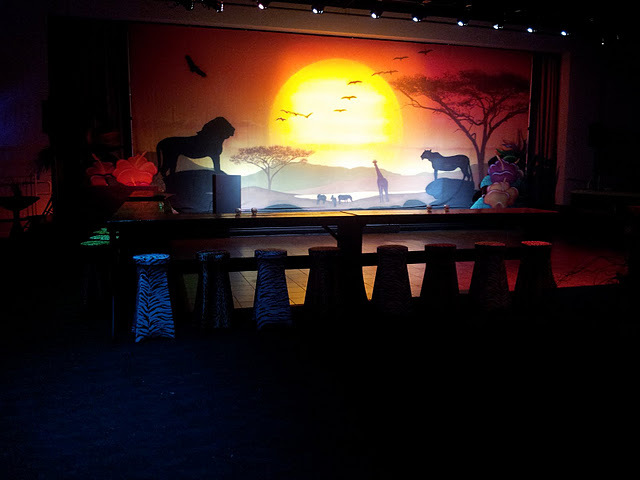 A 20′ x 40′ safari-themed stage backdrop was the perfect accent to the dance floor area. For those guests who would rather watch than dance, our trestle tables paired with our BRAND NEW zebra and leopard print spandex bar stool covers (16 of each available), outlined the dance floor. The MKE team is looking forward to creating unique theme concepts for the 2012 OSI Holiday Party! 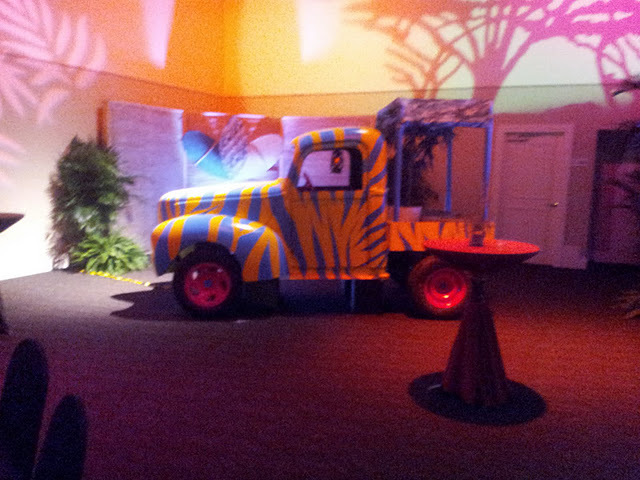 Interested in the Wild Safari theme for your next event? 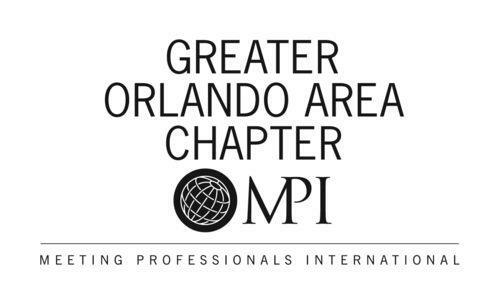 Contact the office today for your proposal!